On 28/11 we don’t limit ouselves to change of regional government, we want to change of state. 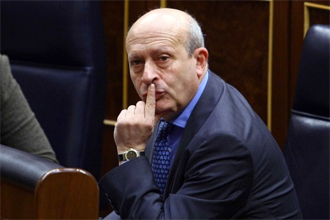 BCN Blog – Education Minister Wert Wants To ‘Impose Spanish’ On The Catalans. Is This Anything New? The latest twist in the neverending Catalan Independence debate came on Wednesday morning when Spanish Minister for Education, Culture and Sport, José Ignacio Wert said in Parliament that he would like to impose Spanish on Catalan students. Before those of you who understand Spanish have a go at me for being biased, here is the complete sentence spoken by Wert not just the section that has been quoted in the the headlines. The difficult word to translate is ‘españolizar’ so I’ll give you a choice between ‘to hispanize’, ‘to Spanishify’, ‘to impose Spanish on’ or ‘to make Catalan students more Spanish’. Just choose the translation you think fits best!